3.75 out of 4 stars. We should all wish to meet someone like Olive, at least for the sarcasm! Crosby, Maine is just a little dot on the map. If one drove by it they would never suspect all the ups and downs the townspeople endure. I suppose that is like everyone’s place they call home, you never can judge a book by its cover. In the case of Olive Kitteridge, she is a retired teacher, who really does seem to have a connection with every citizen of Crosby. Through her lifetime of run ins, analyzing, and sometimes snooping, Olive is able to reflect on herself through her neighbors. Despite the large age gap (I am 29 and she is in her 70s), Olive Kitteridge feels like my kindred spirit, and I would go as far to say that a lot of people could relate to her. This is due to the fact that she is honest and genuine. She understands that she is not perfect but she is not self-loathing at the same time. She adores her family but she is not overly suffocating. However, mostly it is that her life goal has to just been to understand the human condition more. The book is set up as short stories. 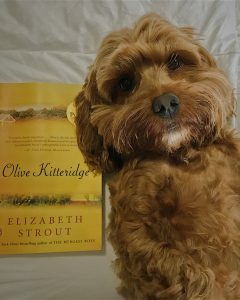 Elizabeth Strout was smart to understand that Olive Kitteridge may not be the cup of tea for everyone ,since she is such a strong character, so she introduced several characters throughout each chapter that the reader can get to know. The main connection is that they all live in Crosby, Maine. I love how you are allowed a chance to fall in love with new people every few pages. Highly recommended and I am just bummed I didn’t pick this book up sooner, when it first came out, so I could of chatted with more people about it! M88 is Asia's best online betting and gaming site. Play live online casino with the M88 babes, sports betting, slots, live lottery, keno, and poker. m88com.